My face has broken out worse than before. Please help. 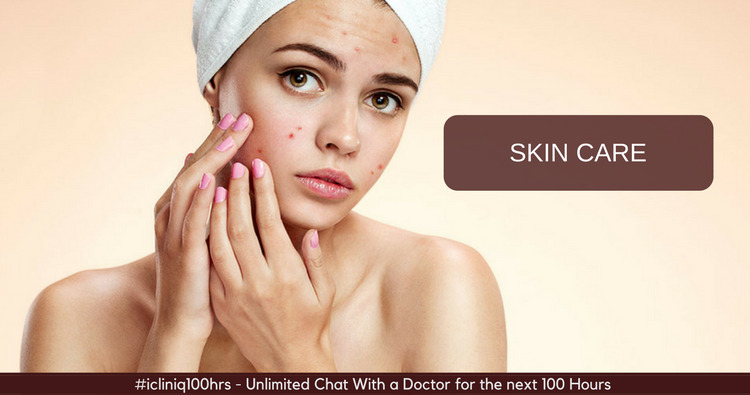 iCliniq › Ask a doctor online › Answers › Dermatology › Acne › My face has broken out worse than before. Please help. Q. My face has broken out worse than before. Please help. I am an 18 year old female. My face is heavily broken out worse than ever before with patches of flaking and peeling of skin over the oily areas. I have had acne since the age of 9, and have had psoriasis since I was 7 which tends to appear on my face during winter and on the rest of my body year round. I wash my face twice a day and drink the right amount of water. My skin has never been this bad and I was wondering what may have set it off. • Can Cotaryl cream be used to cure dry and flaky skin (Ichthyosis)? I have gone through your query and I have viewed the image (attachment removed to protect patient identity). You have inflammatory acne (moderate to severe grade). The flakiness over the oily skin zone is perhaps due to associated seborrheic dermatitis or sebopsoriasis. You would require oral antibiotics like Doxycycline or Minocycline. In addition, I suggest you try using topical Clindamycin and Benzoyl peroxide gel. I would also like to rule out a hormonal etiology such as PCOD (polycystic ovarian disease) as the reason for your acne. If found, you may have to be on monthly hormonal pills. For flakiness over the oily skin zones, you may use cortisone cream twice daily. Consult your specialist doctor, discuss with him or her, and start taking the medicines with their consent. Area between thigh and abdomen is dark. Please suggest a remedy. Which medicine can be used to get rid of chicken-pox scars? I underwent skin peeling treatment for acne but it was of no help. What to do?